Toyota Motor Corp's (TM) reputation for quality took a hit on Monday when influential magazine Consumer Reports pulled its recommendation on three of the Japanese automaker's vehicles, including its popular flagship Camry sedan, due to poor crash test results. While Toyota's luxury Lexus and namesake brands were ranked most reliable in the U.S. auto industry inConsumer Reports' annual new-car reliability survey, the magazine said it will no longer recommend the Camry, Prius v model or RAV4 sport utility vehicle because they received "poor" ratings in a crash test started last year by the Insurance Institute for Highway Safety. "We're a year into it, we've got over 50 vehicles tested and there's enough that are doing adequately on this test that now we're making the shift and pulling recommendations from any car that gets a poor" rating, Jake Fisher, director of auto testing at Consumer Reports, said of the IIHS test. "Honestly, we don't take this lightly, but virtually every vehicle now in the family sedan category has been tested and the only one that has gotten a 'poor' is the Camry," he added. "At this point, we don't feel we can continue to recommend people buy a Camry when there's other good choices out there that do better on the test." Consumer Reports is one of the most widely trusted names for consumers shopping for cars, and companies try to ensure their vehicles earn the magazine's coveted "recommended" rating. Last year, the IIHS, a non-profit group funded by the insurance industry, increased the rigor of its tests to include crashes that involve only a front corner of a vehicle. Consumer Reports waited to adjust its buyer recommendations until it saw how the entire industry was affected by the test. The magazine does not recommend consumers buy a car that fares poorly in any crash tests. In the first nine months of the year, the Camry was the third-most-sold vehicle in the United States, behind two full-size pickup trucks. Its sales were up 1.3 percent from the year-ago period to 318,990 cars, compared with an increase of almost 14 percent by rival Honda Motor Co's Accord sedan. Toyota has made changes to the Camry to improve its performance in the crash tests and IIHS is planning to retest the car in December, IIHS spokesman Russ Rader said. Companies that have modified a vehicle design sometimes seek a retest. Last December, when IIHS gave the Camry its "poor" rating, it said the company's engineers had "a lot of work to do to match the performance of their competitors." Toyota officials said on Monday they "are looking at a range of solutions" to address the car's performance in the crash test. Last month, Toyota's Corolla small car, which was redesigned for the 2014 model year, received a "marginal" rating on the IIHS crash test. In addition to the three Toyota vehicles, Consumer Reports also dropped Volkswagen's Audi A4 car from its recommended list due to a "poor" rating on the IIHS test, Fisher said. Ten other vehicles also lost their recommended status, but that was due to the overall quality of vehicles in their segments and not related to their crash test performances, he said. The IIHS, which continues to score vehicles on side, rear, roll-over and front-end crashes, added an overlap test because nearly one-fourth of U.S. front-of-vehicle crashes that result in serious injury or death involve a single corner that strikes another vehicle or an object like a tree or utility pole. In the overlap test, IIHS crashes a vehicle at 40 miles per hour into a 5-foot-high barrier on the driver's side that overlaps one-quarter of the vehicle's width. 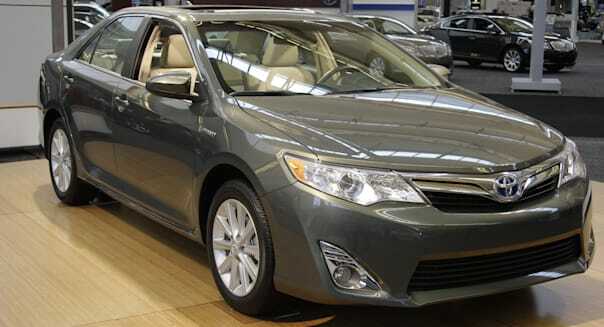 In its annual reliability rankings, Toyota's Lexus was at the top, followed by the Toyota brand. Rounding out the top 10 were Honda's Acura, Audi, Mazda, Nissan's Infiniti, Volvo, Honda, General Motors Co's GMC truck brand and Subaru. The vehicle with the top predicted reliability score was the 2014 Subaru Forester SUV, while Ford Co's C-Max Energi plug-in hybrid vehicle received the worst score, Consumer Reports said. Two popular models, Honda's redesigned 2013 Accord with a V6 engine and the 2013 Nissan Altima, scored too poorly for Consumer Reports to continue recommending them. One of the main problem areas in the survey was in-car electronics, including infotainment systems. Of the 17 categories tracked, the area generated the most complaints, including buggy systems with screen freezes, touch control lag or a reluctance to recognize a cell phone or other device. For instance, last year, Ford tumbled to nearly the bottom of the survey due to flaws in its touch-screen navigation and entertainment system, MyFord Touch. This year, continued problems with the infotainment system, as well as several EcoBoost turbocharged V6 models having poor reliability, left Ford's namesake and Lincoln luxury brands ranked No. 26 and 27, respectively, ahead of only BMW's Mini. Of the 31 Ford models in the survey, only one, the F-150 pickup with the 3.7-liter V6 engine, was above average, while seven scored average. GM's Cadillac brand fell the most in the survey, dropping 14 spots to No. 25 as its CUE infotainment system suffered from issues similar to Ford's. The GM brand also lost the benefit of older cars that typically have fewer problems than newer models. GM's Buick and Chevrolet brands ranked No. 12 and No. 17, respectively. Smaller U.S. rival Chrysler ranked No. 18, while its Ram truck, Jeep SUV and Dodge brands were No. 19, No. 23 and No. 24, respectively. Tesla Motor Inc's Model S electric sedan performed well enough in the reliability survey to earn a recommendation for the first time. Consumer Reports said the findings in its survey are based on subscribers' experiences with 1.1 million vehicles. It uses the findings to compile reliability histories on vehicles and predict how well new cars will hold up.